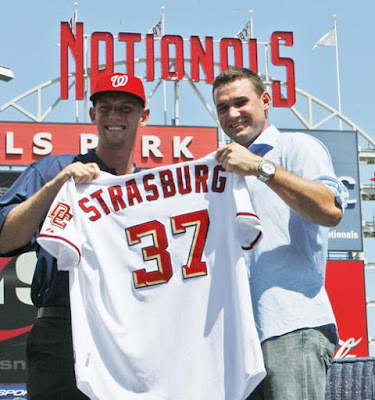 Strasburg, taken first in June's First-Year Player Draft by the Nationals, threw 50 pitches -- 32 of them strikes -- for the Phoenix Desert Dogs. He faced 11 Scottsdale Scorpions hitters, walked one, struck out two, allowed a pair of singles and earned the win in his club's 7-4 victory. The two strikeouts came with one out in the first inning and were of the swinging variety. The first pitch was 99 miles per hour. That was how Washington Nationals prospect Stephen Strasburg announced his presence at the Arizona Fall League...As expected, Strasburg busted out the 88-91 mph changeup he rarely used as an amateur. Not only was it impressive, he used it as an out pitch in the first inning, getting both his strikeouts on changes with good tumble. He showed off a heavy two-seam fastball at 90-94 mph to go with the four-seamer, and his 82-84 mph slider was a solid 60 on the 20-80 scouting scale on this night, though I've seen it even better...It would shock me if he were not in the Nationals' opening day rotation. I think the consensus says that Stephen Strasburg is going to be a force for the Washington Nationals and soon. I would not go out of my way to add a rookie pitcher to my roster but if he came easily and naturally enough (and at a rookie pitcher price) I would gladly accept his presence on my fantasy rosters in 2010.